I love my planner and use it every day, but between work, a special needs kid, and just life, I don't blog about it enough. ...I know sometimes I'm befuddled by what to write down, so you probably are, too. A blank planner page is intimidating. What to write? Do the unimportant things belong on today's plan? Does the page need to be perfect? If you MUST check off everything, be realistic. But if you just need an outline of your day, do that. In my picture, I note actual appointments (with a :00 for on the hour) AND want to do times (like WORK or cleaning for the maid). Unimportant things matter...if you would forget. I won't forget to brush my teeth or take my meds. So those unimportant things won't go on my planner. But I leave the notes area on the bottom to remind me to do my am and pm routine and to remind me what the kids have for homework. Finally, perfection is NOT the goal. Your planner is for you. Don't worry about having a perfect handwriting or plan. 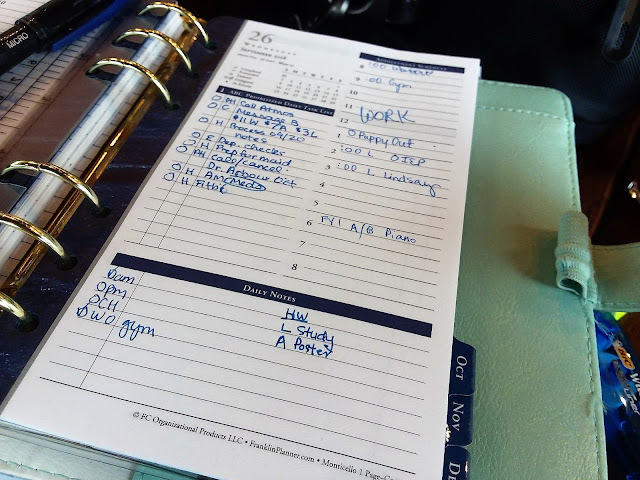 Make it your own, but remember that your planner is a tool, not a novel. Use it appropriately. Kristi, so glad to see your post. You have been inactive for so long. Hope you are doing well and I look forward to seeing more from you. I would like to see a new video from you too! OMG! You're alive! You're still planning! I hope A) this means life is a little less crazy for you than it has been and/or B) you have renewed fervor for producing productivity blogs and videos, both of which I enjoy. I'm sure you've arrived at a new level of organization after all this time juggling work and home. Gotta tell you, your consistency with a compact ring bound planner is utterly admirable! Has brightened my morning to see a post from you. Have missed your practical wisdom! nice to see this pop up. We seem to use planners very similarly.